(Sept. 20, 2018) -- As a multicultural discovery enterprise that trains professionals to succeed in the global economy, UTSA has been named a 2018 rising star by Nature Index. UTSA is ranked No. 19 in the United States and No. 118 in the world among 200 rising academic institutions worldwide. Nature Index Rising Stars identifies the ascendant performers in the world of science, using the power of the Nature Index, which tracks the high-quality research of more than 8,000 global institutions. The ranking profiles the universities, research institutions and countries that have significantly improved their output, often without the longevity and resources that benefit many of the more established institutions that dominate academic rankings. UTSA was recognized for accelerating its rate of publications in top natural sciences journals between 2015 and 2017. In 2017, UTSA had 67 science articles published, a 49.4 percent increase from 2015. Earlier this year, Times Higher Education named UTSA among the top five young universities in the world. 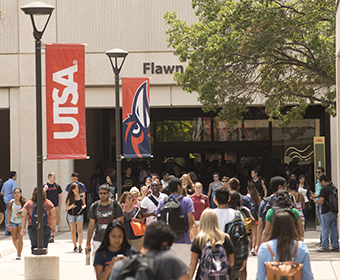 In that ranking, UTSA scored particularly strong in the citations category, which measures research influence by examining the number of times a university's published research was cited by scholars around the world. Read the entire list of Nature Index Rising Stars. Explore research discoveries at UTSA. Learn more about the UTSA College of Sciences.